It's becoming the longest and most labour-intensive job interview of Nathan Shepherd's young life. 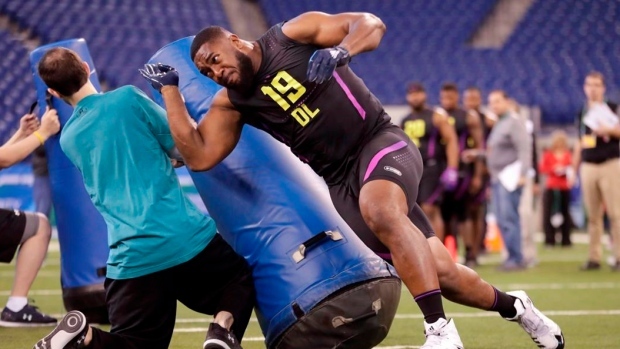 Since completing the 2017 season at Fort Hays State University, the Canadian defensive lineman has attended the Senior Bowl — the first player in his school's history to do so — NFL combine, performed at his pro day and worked out for the Tennessee Titans, New England Patriots, Tampa Bay Buccaneers, Dallas Cowboys, Baltimore Ravens, Arizona Cardinals and Houston Texans. This month, he has private meetings scheduled with the Cardinals, Minnesota Vikings, Atlanta Falcons, Carolina Panthers, New York Jets and Giants, Detroit Lions and Cowboys before working out for the Miami Dolphins. The reason for the staggering schedule is simple: Impress scouts, coaches and GMs to warrant being taken in the NFL draft, scheduled for April 26-28 in Arlington, Texas. "The process is what it is," the six-foot-five, 315-pound, Ajax, Ont., native said in a telephone interview. "I don't worry about tomorrow, it has its own worries. "I just look at what I have on a day-to-day basis and it's not too much or overwhelming. Control what you can and leave the rest to God." Fortunately, a busy schedule means NFL teams are interested. "You want to have these problems," Shepherd said with a chuckle. "A lot of it is just getting used to hurry up and go and just being ready at all time. "But what you appreciate is it's kind of an introduction to the rest of my career so I'm glad I'm getting used to it now." Shepherd registered 38 tackles (12.5 for loss) and four sacks to earn Mid-America Intercollegiate Athletics Association defensive player of the year and NCAA Division III All-American honours last season. Shepherd helped the Tigers (11-0) win their first MIAA title. Shepherd raised eyebrows at the Senior Bowl in Mobile, Ala., before suffering a fractured left hand. Shepherd still attended the NFL combine — he was the lone Canadian there —and participated in the 40-yard dash (5.09 seconds), shuttle (4.53 seconds), broad jump (nine feet, three inches) and vertical jump (31 inches) but skipped the bench press as a precaution. Last month, Shepherd performed at Fort Hays State's pro day before 16 NFL teams. Shepherd said his hand is fine now although he's sure NFL teams will check it to find out for themselves. "I haven't thought about it (hand) at all, to be honest with you," he said. "I didn't bench at the combine just to be safe about things. "You're working to complete fatigue and I wouldn't want to accidentally hurt myself in any way." NFL draft guru Mike Mayock projects Shepherd to go somewhere between the second and third rounds later this month. "Malik Jackson (Jacksonville defensive tackle), that's the comparison I've got, which is a pretty nice comparison," Mayock said. "The nice thing for (Shepherd) is he can play inside and outside. "I think some of the 3-4 teams are going to like him as a five-technique, a defensive end. He's very raw and how high he goes will depend on whether or not teams think he can rush the quarterback from any position." Shepherd hasn't taken the most direct path to the NFL draft. He began his collegiate career at Simon Fraser University in 2012 as a six-foot-one, 205-pound linebacker. But financial challenges forced him to leave school after just one year. "I worked at a plant nursery and in electrical construction, which is what my dad does," Shepherd said. After returning to Toronto in 2014, Shepherd worked at a factory that printed boxes. Once he'd saved up enough money, he enrolled at Fort Hays State for the 2015 season, paying for his first semester while playing football as a walk-on. Following his first season, Shepherd earned a scholarship. That experience, Shepherd says, defines him. "Any team (drafting Shepherd) will get someone who's had to bet on himself since Day 1," he said. "I'm someone who's not easily swayed by whatever is happening, be it in a game or off the field . . . the moment isn't too big for me. "There's plenty of determination because if you look at my story I wasn't offered a scholarship to a Division 1 program. Many people could've just given up . . . but I still had that dream and was able to cultivate it." By missing two seasons, Shepherd was never drafted by a CFL team. But he's currently on the Hamilton Tiger-Cats negotiation list. After months of tryouts and interviews, Shepherd can't wait to finally learn where his NFL future lies. "There are still many questions I have," he said. "I'm very much a planner so just knowing where I'm going and in what round would be nice. "What I'm most excited about is the chain of events that will follow (after draft). I'm just ready to play ball again."